Yep, it’s fall! The leaves are starting to turn in Osaka. Thank the maples for some of fall’s most beautiful colors—and yummy snacks. 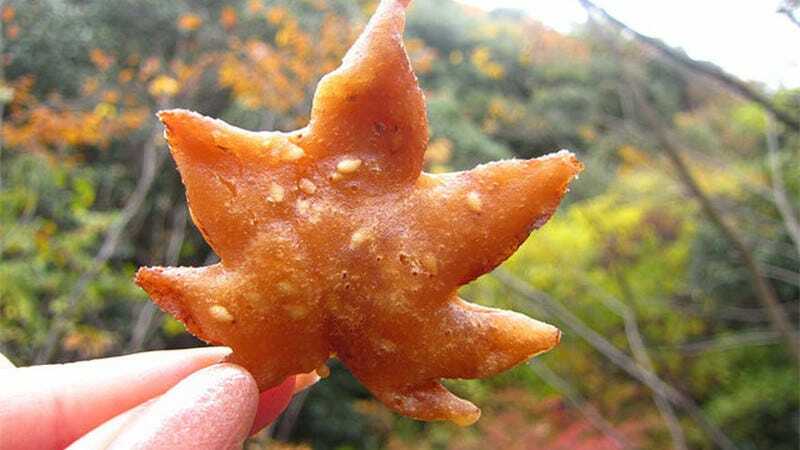 The Japanese maple is called “momiji” (もみじ), and Minoo City is famous for its momiji tempura. Minoo is known for its Japanese maples. Check out the city’s manhole cover. So yes, that’s right, fried leaves. They’re actually quite tasty. But! These are not just regular leaves collected off the ground and then fried. They are preserved in salt barrels for over a year. Then, they’re taken out of the salt and are fried in a delicious, slightly sweet batter for over twenty minutes until they are crisp. They’re great relaxing with a beer (or two!) under the falling leaves. You can eat fried leaves year round, but honestly, the best time to enjoy leaf tempura is while looking at the autumn colors. There is a long history in Japan of getting close to nature, whether that is through seasonal art, poetry or food. And there’s a long history of momiji tempura in Osaka with accounts saying the food was first prepared over a thousand years ago. Though, they certainly haven’t been sealed in plastic bags for that long! The current recipe is the result of being reworked numerous times over the years. If you are ever in North Osaka, give ‘em a try. For more photos, check out the Tabelog link below. This article was originally published on October 2, 2014.